The Civil War was very much an infantryman’s war, with the vast majority of both armies made up of foot soldiers, and most of the time those soldiers had to walk to wherever they were sent. What distance they could cover and in what time would depend greatly on the terrain and other factors, but in reasonable conditions a soldier might expect to cover between 15 and 25 km in a day. If at the double then perhaps up to 40km could be achieved, though it was normal to find that such men would arrive in an exhausted state and with many having fallen out along the way. As usual with these sorts of narrowly defined sets we will start by looking at the poses on offer, which are many and few at the same time. As you would expect, the majority of poses are on the march, all with musket carried on the right shoulder or slung. As with some other 'marching' sets from Strelets, some of the poses concerned us because the musket is being held at least upright (causing all of the weight to be supported by the right hand), and at times apparently leaning forward, which would be uncomfortable and hard to control. The little variations in the pose are all good, but the fourth figure in the second row isn’t really marching at all, but standing and reaching for his cartridges. This is a perfectly good pose, but a surprise in this particular set. The 'command' poses in the third row are an interesting lot, starting with what is simply another marching figure, though perhaps he should be thought of as an NCO. The drummer next to him has his drum slung over his back and is another man clearly not moving at all, though the pose is particularly useful away from the march or the battle. There were many fifers in the Union Army, so good to see one here. Sadly the pose is really bad - no one in history has ever held a fife this way, with both hands to the front, so quite a silly figure. The flag-bearer has several issues, the first being what is he carrying? Despite the suggestion of the box artwork, this is far too small to be a national or regimental colour as it is only about 12 mm tall at the staff, which is 86 cm scaled up. It must therefore be one of the lesser company flags, some of which seem to have been this sort of size. When on the march the regimental colours would have been cased for their protection; they would only be unfurled for some special occasion, to impress some local audience, or if battle seemed imminent. So being uncased as here would be unusual, but more to the point is the very relaxed attitude of the bearer. The flag is being rested casually on the right shoulder, further indicating the low degree of importance attached to it, so this is a very unusual choice for a figure. Next there is a man with sword and sash, so clearly a sergeant or officer, but why he is waving a fist in the air is hard to guess. However he does make a candidate for having a flag thrust into his hands for wargamers especially. 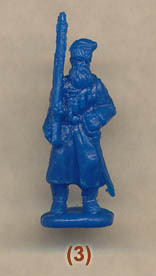 The last officer figure is more conventional, just walking along, though such a man would more often be mounted on the march. The men are remarkably consistent in terms of uniform, and again the box artwork is misleading. Every man here wears the long dress coat with standing collar and without the brass shoulder scales that were normally removed when on campaign. In fact here the coats are particularly long - reaching almost to the knees in many cases, but have been quite well rendered. A study of photographs of the Army of the Potomac suggests 46% of infantry wore the dress coat, so these figures are not wrong, though having some in the sack coat would have been good. All wear the usual fatigue cap, and although in theory musicians had extra braid on their tunic front, photos show many went without this adornment, as do both those in this set. The figure we are assuming to be a sergeant (there are no rank chevrons on any sleeve here) wears a sash around the waist. This is as per regulation, so is not a problem, although the sash was often omitted when in the field. The officer with the brimmed hat has a typical double-breasted frock coat and a sash across the chest. Such a sash indicates that he is the officer of the day, which means he is in charge of the running of the camp or garrison, enacting the commanding officer's orders and, in the field, he might responded to reports from picket lines. The men all carry what would be the usual form of musket, though the positioning means there is very little detail on most. Every man has the haversack, water bottle and cartridge pouch in the correct places, and many have a percussion cap pouch on the waist belt, so all good there. No one has a knapsack, which they might have carried when on the march but could have been on the wagons (or indeed discarded), but we were concerned that not one man has a scabbard for the bayonet, even though all have one fixed to the musket (not usually something you would do if simply on a march). Officer and sergeant both have sword and pistol, with pouch for ammunition for the latter, and the fifer has been given an appropriate case for his instrument, but is unarmed. Sculpting is reasonably good, with fair proportions and nice detail (we particularly liked the facial hair on some of the men). However that detail largely disappears on many of the muskets as we have said. Still the general effect is good, and there is almost no flash anywhere, nor unwanted extra plastic in need of trimming away. Some of the poses with very insecure holds on the musket concerned us, as did the missing bayonet scabbards on every figure. For men on the march we would have liked to have seen a full-sized flag, either unfurled or cased, and more variety of coats would have been nice too, though it is perfectly reasonable to suggest most or all men in many units would have worn the dress coat as here. However given those limitations this is a pretty good set of marching Civil War figures with some useful and interesting command poses not made in this scale before.